SOUTHERN Spaniards are the country’s biggest beer drinkers, a new survey has shown. The report by Nielsen also showed Spaniards are fiercely loyal to local tipples. 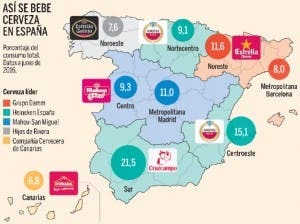 A whopping 21.5% of all beer is drunk in Andalucía and Badajoz, with eastern regions Valencia, Murcia and Albacete consuming the second largest amount, 15.1%. The northeast area, excluding Barcelona, accounts for 11.6% with the Catalan city itself washing down 8% of the total. Boozers in the Madrid metropolitan area consume 11% of the overall total, with the more sparsely populated regions of Galicia and Asturias knocking back 7.6% of all ale. The famous Spanish regional differences are clear in preferred brands, too. Madrilenos prefer a Mahou, Barcelona’s favourite beer is the locally brewed Estrella, whereas Gallegos go for Estrella Galicia. Down south, it’s Cruzcampo for Andalucians, although Dutch beer Amstel is most popular in the east and around the Basque country and Rioja. Call those drinks beer? It’s all wee of a slightly different colour. Totally agree. They have some cheek to call the pi$$ water served in bars in Spain beer. Cruzcampo has to top the list as probably the worst beer ever. Stick to wine Spain, you are good at that. Craft beer a big rip-off, just like gastro pubs. Real ale is good enough for me like – Summer Lightening,Pale Rider, Timothy Taylor and the greatly missed King&Barnes Festive. Had some of that Spanish “craft beer” Fraser. It’s just another word for cloudy crap. no mention of Victoria…..a local brewed lager…!! !